George Zacharopoulos or George Zach as he’s also known, hails from Greece, and has been residing in the UK for the last fourteen years. His one hour stand up show Greek Tragedy centres around growing up Greek and his experiences after moving to the UK when he turned 18. Zacharopoulos feels he is too Greek for his mates in the UK and not Greek enough for his family which is fodder for solid jokes and witty observations delivered in a frenetic pace and his unique Greek/UK combo accent over one hour in the intimate confines of the Red Violin. Zacharopoulos has the advantage of being naturally funny and warm, a trait which wins over the the crowd effortlessly. He takes time to chat to audience members, finding out where they are from and caters his schtick accordingly. The cultural divide between Greece and the UK is explored with absurdity when Zacharopoulos discusses the ‘stolen’ Greek Marbles that are housed within the British Museum and compares this to a hypothetical situation which draws laughter from the packed house. 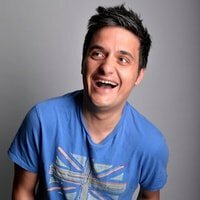 Particularly funny is the story about his English girlfriend Kate meeting his parents, the Greek words she thinks Zacharopoulos is teaching her and the riotous incident which brings this cocky comedian down to earth after his first taste of success. Greek Tragedy is an uplifting, hilarious hour of tales of growing up Greek, Greek mothers, cultural differences, Greek Weddings and is by no means a tragedy that the title suggests. The tragedy is that the show came to an end. Highly Recommended. Don’t miss out. George is at the Red Violin (14 McKillop Street, Melbourne) until April 18th. Tickets available from: http://www.tixnofee.com/listing.php?date=2015-03-25&showid=467 & at the door.